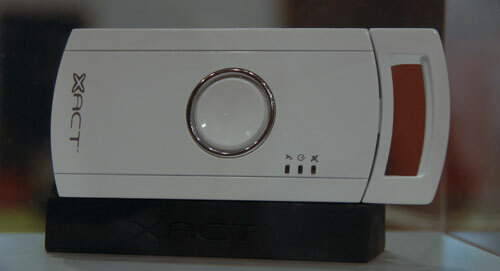 [CES 2009] XACT TRAX Locates Your Stuff For A Buck | OhGizmo! By Evan Ackerman on 01/09/09 • Leave a comment! There are a variety of self contained GPS tracking solutions out there, but most of them seem to assume that you want to know where something is almost all the time, and require you to pay a monthly subscription fee for that service. The fact is, though, that most of the time, you know exactly where your stuff/kids/pets are. It’s that every once in a while panic attack that makes having a GPS tracker worthwhile. The XACT TRAX is just like any other GPS tracking device, with a GPS receiver and a cellular antenna to call home with coordinates, plus the ability to set “fences” around areas and a panic button. The primary difference to the TRAX is that it doesn’t do realtime monitoring, and you don’t have to pay a subscription. Instead, when you want to know where the TRAX is, you just ask it (via the internet or phone), and it’ll tell you and charge you $1. If you have > 15 freak outs about losing stuff per month, then maybe this isn’t for you, but if that’s the case you probably have other things to worry about. If, on the other hand, you’re just worried about things occasionally getting lost or stolen, $1 is not that much to ask for a precise location. The XACT TRAX will be available by the end of Q1 for $249.99.